CERES Agricultural Company has gone into administration this week as its sale to Macquarie’s Viridis Ag of the 9300-hectare Brudle Park cropping aggregation north of Moree for around $50 million is finalised. Ceres Agricultural Co’s other asset in northern New South Wales is Gunyerwarildi, which includes a feedlot and large-scale cropping operation at Warialda, east of Moree. “Brudle Park sold walk-in walk-out, and it settles next week. Contracts have been exchanged unconditionally,” CBRE agent Richard Royle said. CBRE also has the Gunyerwarildi listing, and Mr Royle said the property was the subject of strong interest from more than one party. According to the Australian Securities and Investment Commission, Ceres Agricultural Company’s directors are Sydney resident Garrick Hawkins and Singapore residents John Sheehy and Michael Sweeney. Ceres is fully owned by Pegala Pty Ltd, and both companies share a registered address on O’Connell Road at Oberon on the central tablelands of NSW southeast of Bathurst, also home to the Hawkins family’s showcase Mayfield Gardens. Sources have said Mr Hawkins intended to retain involvement with the Ceres’ Oberon properties, Mayfield and Ballyroe. Administrators Philip Campbell-Wilson and Said Jahani from Grant Thornton Australia’s Sydney office were appointed yesterday by the directors of Ceres Agricultural Company, and they have said yesterday’s development does not extend to any related entities. 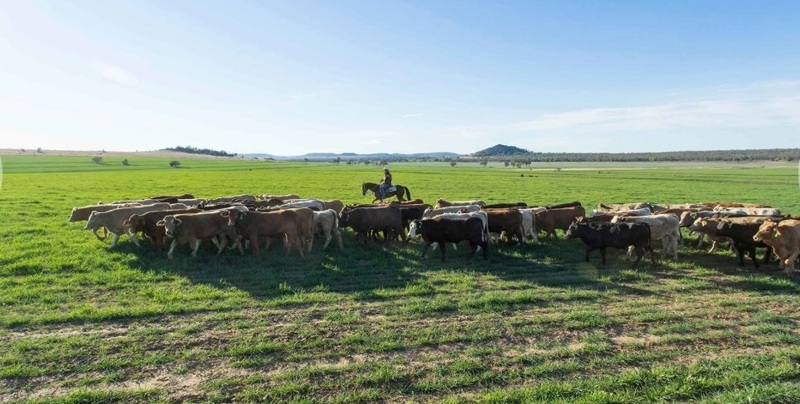 In a statement, the administrators said Ceres Agricultural Company operated one of Australia’s largest integrated cattle-finishing and cropping enterprises with the capacity to finish up to 38,000 head of cattle at its peak, and potential for further expansion. It said the company operated from leased properties at Oberon and Warialda. “While it is too early to confirm the factors which contributed to the need for the company to appoint administrators, it is understood that the company had been experiencing working capital/cash flow issues in recent months,” Mr Campbell-Wilson said. Mr Royle echoed those sentiments. “The combination of drought and expensive cattle and expensive grain has made it very difficult,” he said. Mr Campbell-Wilson said animal welfare was a key priority during the administration process. Mr Campbell-Wilson said the company being in administration would result in further redundancies, following a number of employees having been made redundant in recent months as the business has scaled back. The administrator said a small number of employees may be engaged as part of the finishing process, and a number of employees will be rehired by related entities. “We are mindful that the closure of the company will have an impact not only on employees but on the local communities and businesses that were supported by the company. “Our aim is to make the administration process as smooth as possible for employees and stakeholders, and to provide support and certainty around next steps. The first meeting of creditors will be held on 9 April. The administrators will then conduct further investigations into the affairs of the company and release a report to creditors addressing their findings as to causes of the failure of the company and provide a recommendation as to its future, which may include entering a Deed of Company Arrangement should one be proposed. A second meeting of creditors will then be held.